With Father’s Day only a few short days away, I thought it appropriate to share some perfect gift ideas I came across for the daddy(s) in our lives, just in case you were still searching for something brilliant. One or more of the following is sure to leave father beaming with joy/pride/amazement. If you are alive then you know fathers are constantly being asked to play horsie, giving rides and such to wannabe cowboy/cowgirl children. 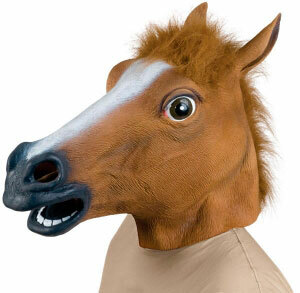 This very life-like rendition of a horse’s head is sure to liven up the mundane activity of horsie-time. Also great for the dad who loves reenacting scenes from The Godfather. A mint is not a mint unless it is laced with the all-natural flavor of bacon. As one of the favorite cured meats in human history, bacon is akin to man’s best friend. Give dad breath that will keep on giving . . . and giving. He’ll be glad you did. For the contemplative dad who likes to think things through at warp speed. 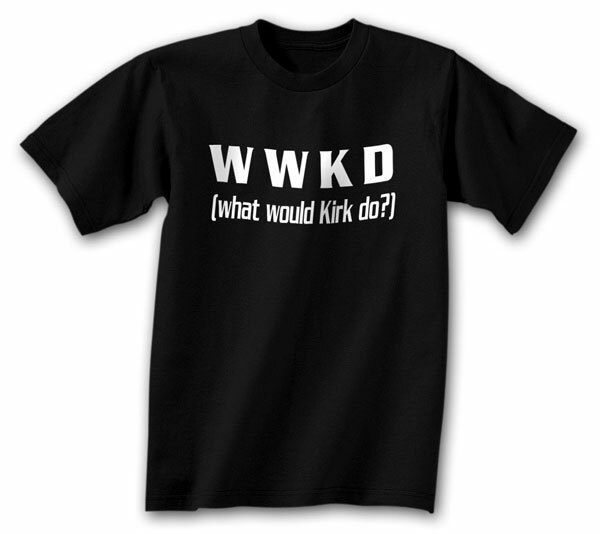 What would Kirk do? is a question that would resonate deeply with any Star Trekky dad. Give him a gift he can wear and read upside down whilst he pretends to be floating in outer space, or during mid-beam-me-up, pondering the great mysteries of the universe. Perfect for the dad who used to be/wants to be a rockstar drummer. 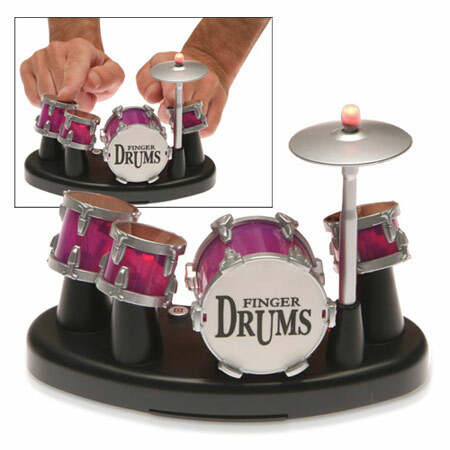 This is a great alternative to the noisier/real drum sets, and a little more endearing than air drumming. Makes for a great coversation piece or icebreaker with dinner guests. For the dad who needs a little more organization in his life. Perfect for the bathroom or the office, where hours of time are devoted. 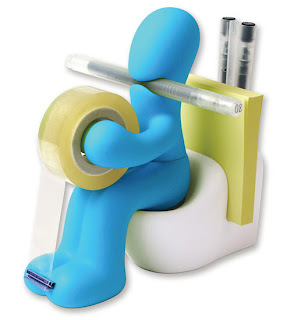 Offers easy access to tape, pens, and post-its, all while depicting a heart-warming slice of life. This is a must-have for all men in today’s day and age when book reading is rampant. Includes tips for fathers, husbands, boyfriends, and other male-like creatures. Offers valuable instruction on how to deal with a daughter in love with a vampire or a werewolf. Also gives step by step instructions on how to woo a lady, make her dream about you, make her weak in the knees for you, get her to marry you, and potentially sell her soul to the devil for you. Men love their facial hair, a beard being the crowning achievement and pinnacle of success. However, there are some circumstances where a beard is not possible. 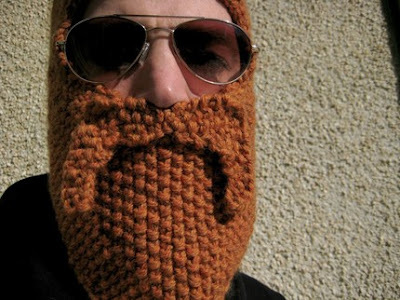 This custom knitted beard offers men who cannot grow a full bodied beard of their own a chance to feel Masculine with a capital M. Also perfect for the man who can grow a beard, but their wife/significant other prohibits unkempt sharp weapons in the house. A hand knit beard would also suit the man who wants the best of both worlds. Clean shaven by day. Beast by night. I hope one of the above gift ideas gave you your “ah-ha” moment. Happy Father’s Day to all you fathers out there! Especially the father of myself, the father of my Husband’s self, their fathers, the fathers before them, etc. And of course the father of my children. More on that guy tomorrow. Love the gift ideas! I am especially fond of the horse head, which is both creepy and funny at the same time. How much fun would it be to watch Dad open THAT box??! Hand knit facial hair....too funny! Yeah, the han knit facial hair would be perfect for my husband because I can't stand the real stuff. 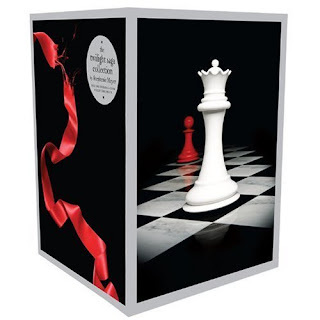 Twilight Saga Collection is the outstanding father's day gifts, In fact, my uncle gifted it to my grandfather. He was very happy to look that.